The Polyphonic Group "CLAUDIO MONTEVERDI" is a non-profit cultural association founded in 1976 and made up by approximately 38 male voices. The polyphonic sacred and secular music certainly represents the most relevant part of the repertoire that the Polyphonic Group “Claudio Monteverdi” successfully brings to churches and theaters both in Italy and abroad. Among the repertoire, we can find 1500’s and Baroque musical compositions by Palestrina, Da Victoria, Gallus, Viadana, Hassler, Monteverdi. Among the Romantic authors, on the other hand, we can find Schubert, Schumann, Sibelius, and Rossini. Concerning modern Polyphonic music: Poulenc, Kodaly, Bardos, Pizzetti, and Orff. Folk music is not forgotten, but presented in accurate elaborations as to meet the musical needs of the choir. 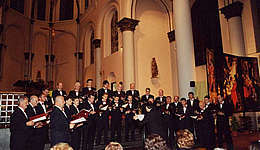 Monteverdi Choir has got in its repertory and it has performed all the choral male music by Francis Poulenc. At the moment, the choir is conducted by Maestro Matjaž Šček. His great musical talent took him to Ljubljana, where he studied the piano at first, but later he dedicated his life and studies to choral music. He studied to become a conductor at Ljubljana Academy of Music and with an accomplished Slovene conductor and composer Lojze Lebič. The “Monteverdi” Choir has been inserted with photos and reviews in the monographic Encyclopedia of Friuli Venezia-Giulia.. Since 2003, it has been recognized by the Regional Assessorship for Education and Culture of the Region Friuli Venezia-Giulia as “cultural organism of Regional relevance”. The Choir is currently directed by maestra Mira Fabjan. She started his career by studying piano and choral singing, and continued his studies with the voice setting and singing at the Music school in Koper (SLO). She graduated in choral conducting and choral composition at the Conservatorio Tartini in Trieste and graduated later at the same Conservatorium in orchestral conducting. Our Association works together with Manuela Marussi, a devouted professional who has nurtured her passion for singing, theater and choral direction since her youth. After her graduation with highest honours at the Music Conservatory "J. Tomadini" of Udine under the guidance of Elena De Martin Zanettovich, she continued her studies in Trieste under maestro Luigi Toffolo, in Milan under Gabriella Rossi and later with the baritone Romano Roma. As well as training the voice technique of choir singers, she directed the Coro Monteverdi during its "Passione di Christo secondo Giovanni" tour which was organised in 2008, a series of concerts whose recordings were used to compose a CD/DVD in 2009. Rossella Candotto is working with the Choir, helping with the reading and the comprehension of musical scores. She graduated in piano at the music conservatory "G. Tartini" of Trieste and in music teaching in Udine (a degree which comprises musical pedagogy, psychology, composing and choir direction). She works in Campolongo Tapogliano as an introductory music teacher at the local preschool and as a music teacher for combined studios at the local elementary school. During 2014 the Choir published the CD Laudate Dominum, which brings together in a single play five hundred years of sacred chant traditions, placing side by side composers such as Corteccia, Candotti and contemporary artists such as Seghizzi, Schönberg, Maiero, Rustja e Grdadolnik.